The aryl hydrocarbon receptor repressor (AhRR) is a member of the aryl hydrocarbon receptor (AhR) signaling cascade, which mediates dioxin toxicity and is involved in regulation of cell growth and differentiation. The AhRR was described as a feedback modulator, which counteracts AhR-dependent gene expression. We investigated the molecular mechanisms of transcriptional regulation of the human AhRR by cloning its regulatory DNA region located in intron I of the AhRR. By means of reporter gene analyses and generation of deletion variants, we identified a functional, 3-methylcholanthrene-sensitive xenobiotic response element (XRE) site. Chromatin immunoprecipitation analyses revealed that the AhRR binds to this XRE, displaying an autoregulatory loop of AhRR expression. In addition we show that an adjacent GC-box is of functional relevance for AhRR transcription, since blocking of this GC-box resulted in a decrease of constitutive and inducible AhRR gene activity. The differences in constitutive AhRR mRNA level observed in HepG2, primary fibroblast, and HeLa cells are directly correlated with CYP1A1 inducibility. We show that the nonresponsiveness of high AhRR-expressing cells toward AhR-agonists is associated with a constitutive binding of the AhRR to XRE sites of CYP1A1. 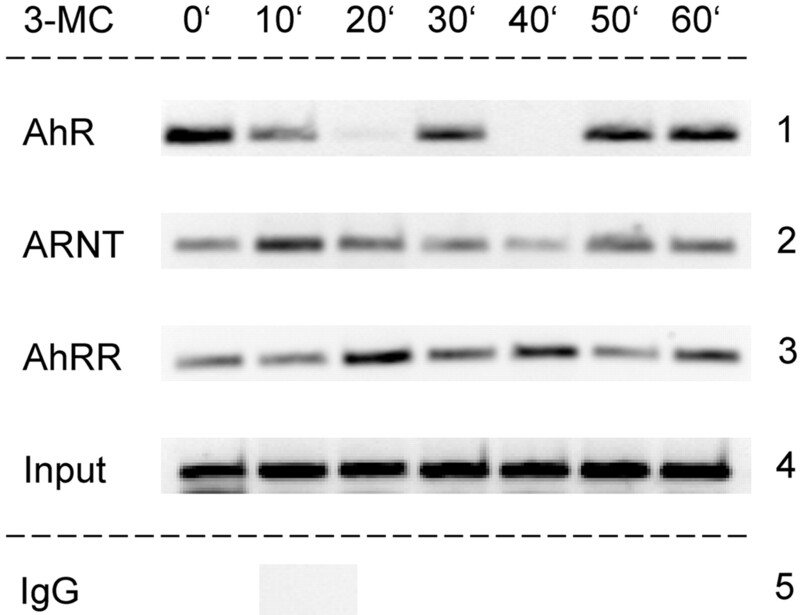 Treatment with the histone deacetylase inhibitor sodium butyrate restored the responsiveness of CYP1A1 in these cell lines, due to the dissociation of AhRR from the XREs. Furthermore, transient AhRR mRNA silencing in untreated HeLa cells was accompanied by an increase of basal CYP1A1 expression, pointing to a constitutive role of the AhRR in regulation of CYP1A1. The functional relevance of the AhRR in high AhRR-expressing primary fibroblasts is discussed. The aryl hydrocarbon receptor (AhR) is a member of the basic helix-loop-helix period/aryl hydrocarbon receptor nuclear translocator/single-minded (bHLH-PAS) protein superfamily that modulates gene transcription in response to developmental and environmental signals (Crews and Fan, 1999; Gu et al., 2000). It is the only known ligand-activated transcription factor in the family of PAS proteins, and it mediates the toxicity of xenobiotic compounds such as 2,3,7,8-tetrachlorodibenzo-p-dioxin, benzo(a)pyrene [B(a)P], and 3-methylcholanthrene (3-MC) (Denison and Nagy, 2003; Bock and Köhle, 2006). The molecular mechanism of AhR activation is well understood and described in several review articles (Mimura and Fujii-Kuriyama, 2003; Marlowe and Puga, 2005; Bock and Köhle, 2006). Briefly, in the inactive nonliganded form, the AhR is located in the cytoplasm as a multiprotein complex consisting of two heat shock proteins 90, the immunophilin-like AIP/XAP2 and the cochaperone p23. Upon ligand binding, this complex dissociates, and the AhR translocates into the nucleus where it dimerizes with the AhR nuclear translocator (ARNT). The resulting heterodimer binds to xenobiotic responsive elements (XREs), which are DNA sequences located in enhancer regions of target genes, and regulates their transcription. The best-characterized AhR target gene is CYP1A1 (Whitlock, 1999; Ma, 2001). Other typical targets for the activated AhR are genes encoding the phase I enzymes CYP1B1 and CYP1A2 and the phase II enzymes UDP-glucuronosyltransferases 1A1 and 1A6 (Bock and Köhle, 2006). Besides its regulatory role in drug metabolism, there is a growing list of evidence that the AhR is involved in regulation of cell proliferation and differentiation (Nebert et al., 2000; Marlowe and Puga, 2005; Bock and Köhle, 2006). The AhR repressor (AhRR), another member of the bHLH-PAS protein family, was discovered in 1999, and it was identified as a new AhR-regulated gene (Mimura et al., 1999). The function of the AhRR was described as a negative feedback modulator of the AhR pathway, doing this by competing with the AhR for ARNT- and XRE-binding, thereby blocking AhR-dependent gene expression (Mimura et al., 1999). The AhRR gene was detected in several species, including fish, rat, mice and humans (Tsuchiya et al., 2003a; Korkalainen et al., 2004; Yamamoto et al., 2004; Evans et al., 2005; Bernshausen et al., 2006; Nishihashi et al., 2006; Roy et al., 2006). Expression analysis of AhRR mRNA in different organs of mice, rats, and humans revealed a tissue-specific expression of the AhRR (Tsuchiya et al., 2003a; Korkalainen et al., 2004; Yamamoto et al., 2004; Bernshausen et al., 2006; Nishihashi et al., 2006). The same was observed in several human cell lines where AhRR transcripts display a cell type-specific expression pattern (Tsuchiya et al., 2003a). The molecular mechanisms behind the organ- and cell-specific differences in AhRR expression are still unknown. So far, only a few articles concerning transcriptional regulation of the AhRR have been published (Baba et al., 2001; Nishihashi et al., 2006). Several XRE sites and three GC-boxes of functional relevance have been identified in the 5′ upstream region of the mouse AhRR gene. Up to now, no experimental data were reported for the transcriptional regulation of the human AhRR. In this study, we investigated the transcriptional regulation and the molecular function of the AhRR in human cell lines. We cloned regulatory regions within intron 1 of the AhRR gene, and we analyzed the expression and function of the AhRR in different human cell lines: the AhR agonist-responsive cell line HepG2 and the nonresponsive primary fibroblast and HeLa cells. Our data identify functionally active regulatory sequences in intron 1 of the human AhRR, and they show that the AhRR is involved in the transcriptional regulation of the AhR-sensitive CYP1A1 gene. Materials. Cell culture media and the chemicals B(a)P, 3-MC, Plicamycin (mithramycin A; MitA), and sodium butyrate (NaB) were purchased from Sigma-Aldrich (Munich, Germany). Restriction endonucleases, Moloney murine leukemia virus reverse transcriptase, and FuGENE 6 transfection reagent were supplied by Roche Diagnostics (Mannheim, Germany). Taq polymerase, RNeasy Mini kit, Plasmid Midi kit, and SYBR Green PCR kit were obtained from QIAGEN GmbH (Hilden, Germany). Dual-luciferase reporter assay kit and the pGL3-basic vector system were purchased from Promega (Mannheim, Germany). The DNA Blunting kit was from Takara (Kyoto, Japan), and the competent TOP10 Escherichia coli cells were from Invitrogen (Karlsruhe, Germany). Protein A-Sepharose, anti-AhR, and anti-ARNT were obtained from BIOMOL Research Laboratories (Hamburg, Germany), and Protease Inhibitor Cocktail III was from Calbiochem (Darmstadt, Germany). Oligonucleotides and siRNAs were obtained from MWG-Biotech AG (Ebersberg, Germany). AhRR antiserum was prepared by immunizing rabbits against the specific peptide sequence CQFQGKLKFLFGQKKK. Cell Culture and Treatment. The human hepatocarcinoma cell line HepG2 and the human cervical adenocarcinoma cell line HeLa were cultured in RPMI 1640 medium with 3.7% (w/v) NaHCO3 and 10% (v/v) fetal calf serum. Dermal primary fibroblasts, isolated from human foreskin, were cultured in minimum essential medium Eagle adjusted with 2 mM glutamine and 10% (v/v) fetal calf serum. For RT-PCR analyses, reporter gene assays, and siRNA experiments, 2 × 105 cells/well were seeded and maintained under standard conditions at 37°C and 6.5% CO2. In general, treatment of the cells was performed 24 h after seeding. 3-MC and 3′-methoxy 4′-nitroflavone (MNF) were dissolved in DMSO, B(a)P in tetrahydrofurane. NaB and MitA were dissolved in sterile water. Exposure of cells to either 3-MC, MNF or B(a)P occurred in a final concentration of 10 μM. NaB or MitA were used in a concentration of 10 mM or 150 nM, respectively. Times of treatments are indicated in the figure legends. Quantitative Real-Time PCR. Total RNA was isolated from cells using the RNeasy Mini kit, according to the manufacturer's instructions, including DNase I digestion. Subsequently, 1 μg of total RNA was reverse transcribed in a final volume of 40 μl using Moloney murine leukemia virus reverse transcriptase. Quantitative real-time PCR was carried out in a LightCycler instrument (Roche Diagnostics) using the QuantiTect SYBR Green PCR kit and 2 μl of each cDNA sample. The relative copy numbers of AhRR and CYP1A1 transcripts were calculated by the LightCycler software, and the values were normalized against the relative amount of β-actin transcripts. Each sample was analyzed in triplicate. The oligonucleotide sequences and annealing temperatures for amplification of human CYP1A1, AhRR, and β-actin were described previously (Fritsche et al., 2005). Chromatin Immunoprecipitation Assays. Confluent flasks of HepG2, HeLa, or primary fibroblast cells (∼2–3 × 107) were rinsed with phosphatebuffered saline (PBS) and crosslinked with 1% formaldehyde for 10 min at room temperature. Crosslinking was stopped by adding glycine to a final concentration of 0.125 mM. Cells were rinsed twice with ice-cold PBS, scraped in 5 ml of ice-cold PBS, and pelleted by centrifugation. Pellets were washed with PBS, and then they were resuspended in 1 ml of lysis buffer (1% SDS, 10 mM EDTA, 50 mM Tris-HCl, pH 8.1, and complete protease inhibitor cocktail) and incubated for 30 min on ice. Lysates were sonicated (3–4 × 10 s) with a Branson Sonifier 250 to produce DNA fragments between 0.2 kb and 1.5 kb. Lysates were centrifuged for 20 min at 4°C, and supernatants were aliquoted. Nine volumes of dilution buffer (0.01% SDS, 1.1% Triton X-100, 1.2 mM EDTA, 16.7 mM Tris-HCl, pH 8.1, 150 mM NaCl, and complete protease inhibitor cocktail) was added to supernatants. Samples were pre-cleared by adding 35 μl of a 50% protein A-Sepharose slurry, blocked with sheared salmon sperm DNA, and bovine serum albumin. After 2 h of incubation at 4°C on a rotating wheel, beads were pelleted and supernatants were transferred into new tubes. An appropriate amount of antibody was added, and samples were incubated overnight at 4°C on a rotating wheel. Immunocomplexes were precipitated by adding 30 μl of blocked beads. Beads were pelleted and washed sequentially with low salt buffer (0.1% SDS, 1.0% Triton X-100, 2 mM EDTA, 20 mM Tris-HCl, pH 8.1, and 150 mM NaCl), high salt buffer (0.1% SDS, 1.0% Triton X-100, 2 mM EDTA, 20 mM Tris-HCl, pH 8.1, and 0.5 M NaCl) and LiCl buffer (250 mM LiCl, 1% nonidet P-40, 1% Na-deoxycholate, 1 mM EDTA, 10 mM Tris-HCl, pH 8.1). Finally, beads were washed twice in TE buffer (10 mM Tris, pH 8.1, 1 mM EDTA). Immunocomplexes were eluted by adding 200 μl of elution buffer (1% SDS and 100 mM NaHCO3). Eluates were digested with proteinase K for 2 h at 55°C, followed by a de-crosslinking step at 65°C overnight. DNA was purified by phenol-chloroform extraction, ethanol-precipitated, and resuspended in 25 μl of water. Aliquots of every ChIP sample were diluted 1 to 5 and 1 to 10. Subsequently, 5 μl of each dilution were amplified in 35 to 40 PCR cycles, using Taq polymerase. Oligonucleotides used for detection of the XRE-bearing fragment of the human CYP1A1 gene were published previously (Hestermann and Brown, 2003). The oligonucleotides for amplification of the XRE-containing AhRR sequence (+17.388 to +17.711) were 5′-AACCGGATGGCGTCTCCGGTTC-3′ and 5′-GAGCGCATCCCGTCTCCACC-3′, the annealing temperature was 64°C. Generation of AhRR Reporter Gene Plasmids. The reporter construct pAhRR was created by insertion of a 1025-bp fragment of AhRR intron I (+16.873 to +17.897) into the KpnI/XhoI site of the pGL3-basic vector. The AhRR fragment was amplified by PCR using the following linker-primer: 5′-GACGGTACCCAGGCAGGACCCTGCTCTCGG-3′ and 5′-CTCTCGAGGGGACGCTGAGGACCACGAACCGT-3′. Deletion constructs of pAhRR were produced by endonuclease restriction and subsequent religation of the plasmids. For construction of pAhRR-Δ1, the pAhRR plasmid was digested with BglII and PvuII. The pAhRR-Δ2 construct was generated by cutting pAhRR with KpnI and PvuII. Digestion of pAhRR with BglII and BssHII lead to the pAhRR-Δ3 deletion and with KpnI and BssHII to the pAhRR-Δ4 construct, respectively. The pAhRR-Δ5 was produced by cutting pAhRR-Δ2 with BglII and BssHII. After enzyme digestion, the plasmids were religated using the Takara DNA Blunting kit. The pAhRR-mut construct was synthesized by Slonomics BioTechnology GmbH (Puchheim, Germany). The core sequence GCGTG of XRE-3 was modified to TTCTC. All of the abovementioned reporter constructs were transformed into TOP10 E. coli cells using the heat shock method. Subsequently, multiplied plasmids were recovered using the QIAGEN Plasmid Midi kit. Reporter Gene Assays. HepG2 cells (2 × 105/well) were seeded into six-well plates, and they were maintained overnight under standard conditions. Cells were transiently transfected with 2 μg/well AhRR reporter constructs or empty pGL3-basic vector and 50 ng/well pRL-TK Renilla luciferase control plasmid by using the FuGENE 6 transfection system. After 4 h of incubation, the transfection reagent/DNA mix was replaced by fresh full medium, and cells were incubated overnight. Cells were treated with the indicated substances for 24 or 48 h. The cell lysates were collected, and luciferase activities of the pAhRR reporter plasmids were determined using the dual-luciferase assay system in a Multi-Bioluminat LB 9505C (Berthold Technologies, Bad Wild-bad, Germany). Firefly luciferase activity was normalized to Renilla luciferase activity. Transient RNA-Interference Experiments. For transient transfection of HeLa cells with AhRR siRNA, 2 × 105 cells/well were seeded into six-well plates and cultured overnight. The cells were transfected with 100 nM AhRR siRNA or nonsilencing control sequences using the FuGENE 6 reagent. The AhRR siRNA sequences were sense 5′-GCAACGAUCGUGGACUAUC-3′ and antisense 5′-GAUAGUCCACGAUCGUUGC-3′. Efficiency of AhRR knockdown was tested by quantitative real-time PCR. Bioinformatics. DNA sequence analyses were performed using the National Center for Biotechnology Information BLAST tools (http://www.ncbi.nlm.nih.gov/BLAST/) and a GCG-based software package, provided by the HUSAR Bioinformatics Lab (http://genome.dkfz-heidelberg.de/). In addition, putative transcription factor binding sites were analyzed using TESS (http://www.cbil.upenn.edu/cgi-bin/tess/tess) and Tfsitescan databases (http://www.ifti.org/cgi-bin/ifti/Tfsitescan.pl). The nucleotide sequences used in this work are available via GenBank accession numbers NT_006576.15, AH010004, and NM_020731. In this study, the beginning of human AhRR exon 1 is designated as base +1. Statistics. All data are presented as mean ± standard deviation. Data were analyzed using analysis of variance and Student's t test (Excel; Microsoft, Redmond, WA). P values below 0.05 were considered as significant. Identification of Functional XRE Sites in the HumanAhRRGene. To assess the regulatory activities of the human AhRR gene, we performed computer-based promoter analyses, and we identified four putative XRE sites located at position +16.959 (XRE-1), +17.143 (XRE-2), +17.507 (XRE-3), and +17.678 (XRE-4) (Fig. 1A). To examine the functional relevance of these sites, we then amplified a XRE-1 to -4-containing 1.025-kb DNA fragment of intron 1 and fused it into the luciferase expression vector pGL3-basic (pAhRR). Treatment of pAhRR-transfected HepG2 cells with 10 μM AhR agonist 3-MC for 48 h resulted in a 600- to 700-fold increase of luciferase activity in comparison with the basal activity of the empty vector pGL3-basic, indicating that at least one of the four XREs is probably functional (Fig. 1B). In comparison with the respective solvent control, the pAhRR-driven luciferase activity was 7- to 8-fold enhanced after 3-MC treatment. To identify functional XRE motifs within this regulatory fragment, we performed deletion analyses with pAhRR. Removal of the putative XRE-3 and -4 sites (Fig. 1B; pAhRR-Δ1) resulted in a loss of basal and 3-MC-induced luciferase activity. In contrast, the deletion of XRE-1 and -2 motifs (Fig. 1B; pAhRR-Δ2) retained the responsiveness of the luciferase reporter gene toward solvent and 3-MC. The measured activities were within the same range as detected for pAhRR. These results indicate that either XRE-3 or XRE-4 mediate the activity of the luciferase reporter plasmids. Therefore, we generated two additional deletion constructs containing the putative XRE-3 or XRE-4 sites. Transfection of HepG2 cells with the pAhRR-Δ4 lacking XRE-3 resulted in a significant decrease of luciferase activities compared with pAhRR or pAhRR-Δ2, respectively (Fig. 1B). In contrast, deletion of XRE-4 had no influence on constitutive and 3-MC induced luciferase activity (Fig. 1B; pAhRR-Δ5), indicating that only XRE-3 is of functional importance for AhRR promoter activity. To investigate the functional activity of XRE-3, the GCGTG core sequence was changed to TTCTC. As seen in Fig. 1B, this mutation (pAhRR-mut) resulted in a significant loss of basal and inducible luciferase activity. This result confirms the functional importance of XRE-3 in AhRR gene regulation. To confirm that the 3-MC induced luciferase expression is mediated by the activated AhR, AhR activity was pharmaceutically blocked by cotreatment of the transfected cells with the specific AhR antagonist MNF (Lu et al., 1995). In presence of MNF, the 3-MC-induced reporter gene activity was reduced to the level of solvent control (Fig. 1C). The data from the reporter gene analyses confirm that the XRE-3 site is functional as an inducible enhancer element. Identification of functional XRE sites within intron 1 of the human AhRR gene. A, schematic structure (not scaled) of the human AhRR gene and localization of the cloned regulatory region of intron 1. B, reporter gene assays. HepG2 cells were transfected with 2 μgof pGL3-basic, pAhRR, each of the generated deletion constructs pAhRR-Δ1 to -Δ5, and the pAhRR-mut construct. Twenty-four hours later, cells were treated for 48 h with 10 μM 3-MC or solvent (DMSO) (final concentration 0.1%). Firefly luciferase activities were measured and corrected to Renilla luciferase activities as described under Materials and Methods. Relative luciferase activities are presented as -fold of the solvent treated empty vector pGL3-basic (white oval, XRE; gray box, GC-box). C, effect of MNF on the 3-MC-inducible luciferase activity of pAhRR-Δ5. Transfected HepG2 cells were treated for 48 h with DMSO (final concentration 0.1%), 10 μM 3-MC, and a combination of 10 μM 3-MC/10 μM MNF. Relative luciferase activities are shown as -fold of solvent control. *, significantly different from solvent control; †, significantly reduced in comparison with the 3-MC treated sample. Data are shown from three independent experiments, and samples were analyzed in triplicates. Binding of AhR, ARNT, and AhRR to XRE-3 of the HumanAhRRGene. To investigate whether the AhR, ARNT, and the AhRR are functionally integrated in the constitutive and inducible expression of the human AhRR gene, we performed ChIP assays. As shown in Fig. 2, binding of AhR, ARNT, and AhRR to the XRE-3 of the AhRR gene was detected in untreated HepG2 cells. Treatment of the cells with 10 μM 3-MC for a period of 60 min led to an oscillating binding pattern of the three proteins. After 20 min of 3-MC exposure, a strong XRE binding of the AhRR protein was detected. At this time, the AhR seemed to be displaced from the respective XRE. At later times, we observed a strong AhR/XRE association, whereas the AhRR binding signal seemed to diminish. The results of the ChIP analyses suggest that the AhRR is involved in the regulation of its own transcription. Chromatin immunoprecipitation of a XRE-3 containing AhRR fragment. HepG2 cells were treated for 0, 10, 20, 30, 40, 50, and 60 min with 10 μM 3-MC. 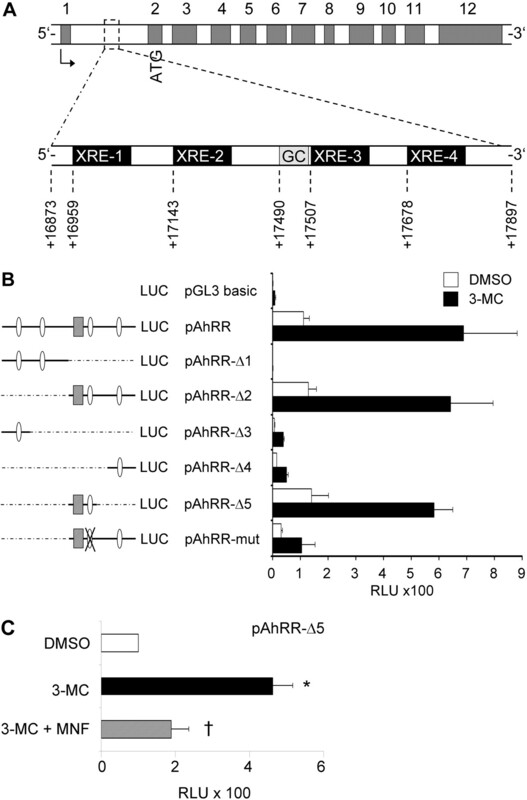 Chromatin samples were immunoprecipitated with antibodies against AhR (row 1), ARNT (row 2), and AhRR (row 3). The input signals are shown in row 4, and the IgG control is shown in row 5. Involvement of a GC-Box Sequence in Regulation of AhRR Gene Expression. As seen in Fig. 1A, sequence analysis of the cloned AhRR fragment revealed a GC-box sequence 8bp 5′-upstream of XRE-3. Therefore, we questioned whether this sequence is of functional relevance for the transcriptional regulation of the AhRR gene. Luciferase assays disclosed that in the absence of any inducer, the activities of the pAhRR, pAhRR-Δ2, and pAhRR-Δ5 plasmids, which are GC-box proficient, were approximately 100-fold higher than the basic activity of the pGL3-basic vector (Fig. 1B). In contrast, the deletion constructs, which lack the GC-box (Fig. 1B; pAhRR-Δ1, pAhRR-Δ3, and pAhRR-Δ4) obtain significantly less constitutive luciferase activities. To confirm that these constitutive activities can be indeed attributed to the putative GC-box, we treated the pAhRR-Δ5 harboring HepG2 cells with MitA. This chemical is known to bind to GC-rich DNA sequences, thereby inhibiting the binding of zinc finger-containing transcription factors such as Sp1 (Blume et al., 1991; Nehls et al., 1993). As shown in Fig. 3, exposure of the transfected cells to MitA resulted in a significant decrease in constitutive luciferase activity of pAhRR-Δ5. To analyze whether MitA treatment also influences the inducible luciferase activity, transfected cells were cotreated for 24 h with 3-MC and MitA. In the presence of MitA, we observed a significant reduction of luciferase response of the reporter gene toward 3-MC (Fig. 3), suggesting a cooperative action of XRE-3 and GC-box sequences on the constitutive and inducible regulation of the human AhRR gene. This cooperative mode of action was verified by the finding that the mutation of XRE-3 led to a significant reduction of constitutive and inducible luciferase activity (Fig. 1B; pAhRR-mut). To further support these findings, RT-PCR analyses were performed in HeLa cells, which are known to express high constitutive levels of AhRR mRNA (Tsuchiya et al., 2003a). Treatment of these cells with MitA over a period of 12 h led to a time-dependent decrease of AhRR mRNA (Fig. 4A). Three hours after MitA exposure, the measured AhRR expression was reduced to 50% of the control value, indicating a rapid turnover of the AhRR mRNA in HeLa cells. After 12 h of MitA treatment, AhRR mRNA was reduced to 25% of the control value (Fig. 4A). To address whether the decrease of AhRR mRNA is associated with changes of CYP1A1 expression, we performed RT-PCR analyses. As seen in Fig. 4A, the decrease of AhRR mRNA is accompanied by a gradual increase of CYP1A1 transcription. Twelve hours after MitA treatment, CYP1A1 expression was 4- to 5-fold enhanced. Since HeLa cells are known to be nonresponsive toward AhR agonists (Iwanari et al., 2002), we investigated whether MitA treatment restores the responsiveness of CYP1A1 toward 3-MC. The results show that cotreatment of HeLa cells with 3-MC and MitA led to an ∼7-fold increase of CYP1A1 gene expression, whereas the AhRR mRNA content was reduced to 20% of the control value (Fig. 4B). 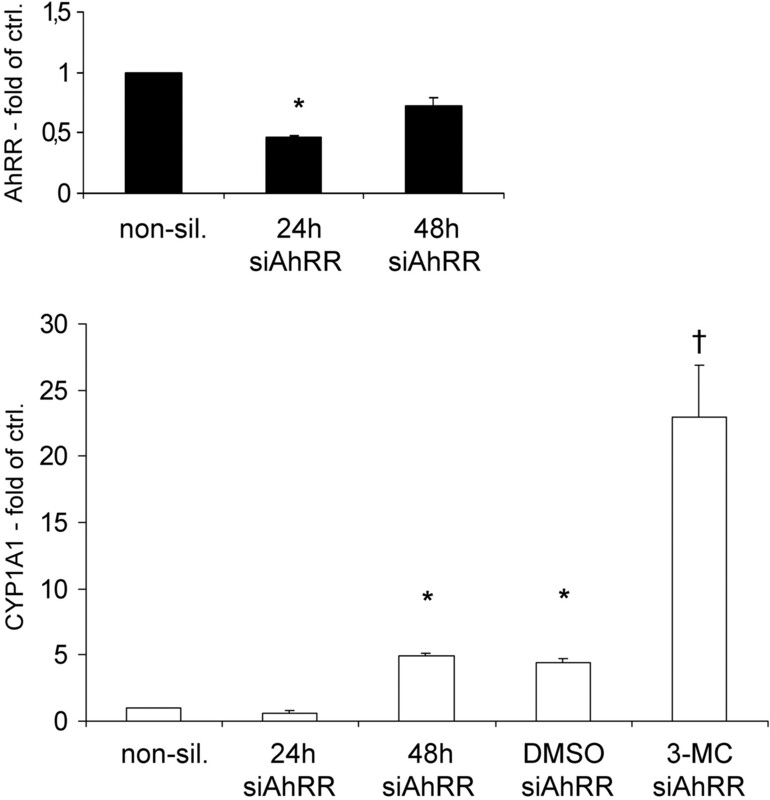 Exposure of the cells to 3-MC alone had no influence on AhRR or CYP1A1 expression. Taken together, the PCR and reporter gene data support the supposition of a cooperative interaction between XRE- and GC-box motifs in regulation of AhRR transcription. Furthermore, the MitA experiments performed in HeLa cells strongly indicate an important role of AhRR in the control of CYP1A1 expression. Inhibition of basal and inducible luciferase activity by MitA in HepG2 cells transiently transfected with the pAhRR-Δ5 plasmid. Cells were transfected with 2 μgofthe pAhRR-Δ5 deletion construct and incubated overnight. Cells were treated for 24 h with 10 μM 3-MC, 150 nM MitA, or in combination 10 μM 3-MC/150 nM MitA. Luciferase activities were measured as described under Materials and Methods. The results are shown as -fold of untreated control. *, significantly different from the solvent control; †, significantly reduced in comparison with the 3-MC treated sample. The number of experiments and replicates are as described in the legend of Fig. 1. The AhRR Mediates the Nonresponsiveness of Fibroblast and HeLa Cells toward AhR Agonists. HeLa cells and fibroblasts are considered as high AhRR-expressing cell lines and known to be nonresponsive toward AhR agonists (Gradin et al., 1999; Iwanari et al., 2002; Tsuchiya et al., 2003a). In agreement with these data (Tsuchiya et al., 2003a), AhRR mRNA expression was 5-fold higher in fibroblast and 10-fold higher in HeLa cells compared with HepG2 cells (data not shown). In both cell lines, the expression of CYP1A1 remained unchanged after treatment with 3-MC or B(a)P. Our results disclose a possible role of the AhRR in modulating the constitutive and inducible CYP1A1 expression. Therefore, we asked whether a transient down-regulation of AhRR mRNA might be associated with a modulation of CYP1A1 expression. As shown in Fig. 5, transient silencing of AhRR mRNA was accompanied with an ∼5-fold increase of constitutive and an ∼20-fold increase of 3-MC-induced CYP1A1 mRNA expression in HeLa cells. This result points toward a suppressive activity of the AhRR on CYP1A1 expression in HeLa cells, possibly due to binding of the AhRR to XRE sites. To test this hypothesis, we performed ChIP analyses using an anti-AhRR antibody. 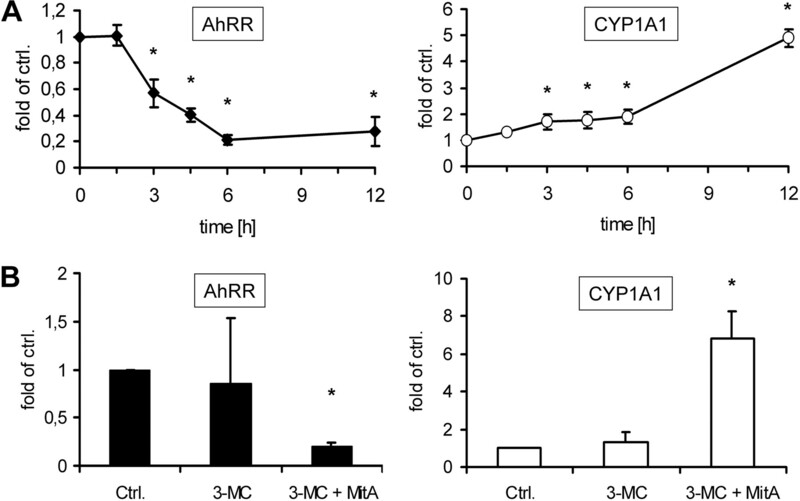 Untreated primary fibroblasts reveal a strong binding of the AhRR to the CYP1A1 XRE (Fig. 6). Treatment of the fibroblasts with B(a)P did not affect the AhRR/XRE association. Since it was reported that the HDAC inhibitors trichostatin A (TSA) and NaB restore responsiveness of the CYP1A1 gene toward 2,3,7,8-tetrachlorodibenzo-p-dioxin and 3-MC in fibroblasts (Gradin et al., 1999; Nakajima et al., 2003), we treated our fibroblasts with NaB alone or in combination with B(a)P. As shown in Fig. 6A, NaB exposure displaced the AhRR from the XRE of the CYP1A1 gene. This effect was more pronounced in cells that were cotreated with NaB and B(a)P. Comparable results were obtained from ChIP assays performed in HeLa cells (Fig. 6B). Treatment of this cell line with NaB confirmed the sensitivity of the observed constitutive AhRR/XRE association toward the HDAC inhibitor. Effect of MitA exposure on constitutive and inducible expression of AhRR and CYP1A1 mRNA in HeLa cells. AhRR and CYP1A1 mRNA levels were quantified using real-time PCR and normalized to β-actin transcripts. Expression levels are given as -fold of untreated control. A, influence of MitA on constitutive mRNA expression of AhRR and CYP1A1. Cells were treated for 1.5, 3, 4.5, 6, and 12 h with 150 nM MitA. B, effect of MitA on inducible AhRR and CYP1A1 mRNA expression. Cells were treated for 12 h with 10 μM 3-MC alone or in combination with 150 nM MitA. *, significantly different from solvent control (DMSO). The number of experiments and replicates are as described in the legend of Fig. 1. To assess the responsiveness of CYP1A1 in primary fibroblast and HeLa cells, we performed RT-PCR analyses after treating the cells with NaB and a combination of NaB and B(a)P. In comparison with the control values, NaB enhanced CYP1A1 mRNA 2-fold in fibroblasts and 30-fold in HeLa cells (Fig. 6C). Cotreatment with B(a)P resulted in an ∼200-fold induction of CYP1A1 mRNA in fibroblasts and an ∼400-fold enhancement of CYP1A1 mRNA in HeLa cells (Fig. 6C). It has to be mentioned, that neither NaB nor the combination of NaB/B(a)P led to changes in AhRR mRNA expression in fibroblast and HeLa cells (data not shown). Thus, the data from the ChIP analyses and the PCR experiments support the previous notion that the nonresponsiveness of CYP1A1 in primary fibroblast and HeLa cells is mediated by the inhibitory activity of the AhRR and that HDACs are involved in this gene regulation. Effect of a transient AhRR knockdown on CYP1A1 gene expression in HeLa cells. HeLa cells were transfected with 100 nM siRNA using the FuGENE reagent. Twenty-four and 48 h after transfection, mRNA levels of AhRR and CYP1A1 were determined by RT-PCR analyses and normalized to β-actin transcripts. For the 3-MC-studies, cells were transfected for 24 h with siRNA and then treated with DMSO or 10 μM 3-MC for 24 h. Treatment 24 h. Expression levels are given as-fold of nonsilencing controls or DMSO-treated nonsilencing controls. *, significantly different from nonsilencing control; †, significantly reduced in comparison with the DMSO-treated sample. The number of experiments and replicates are as described in the legend of Fig. 1. The human AhRR gene is located on chromosome 5p15.33 and distributed in a total sequence length of approximately 130 kb. The gene consists of 12 exons with the ATG start codon in exon 2. The DNA binding bHLH domain is encoded by exon 3 and the PAS domain by exons 5 and 6 (Cauchi et al., 2003). We identified four putative XRE sites in intron I of the AhRR gene, and we subsequently cloned this 1.025-kb DNA fragment into a luciferase reporter plasmid (Fig. 1A). By means of reporter gene assays, generation of different deletion constructs and mutational analysis, we were able to show that the XRE-3 has functional activity as indicated by 3-MC responsiveness (Fig. 1, B and C). This XRE-3 is located at position +17.507 and contains the classic XRE core sequence GCGTG. To confirm the functional importance of the identified XRE-3, we analyzed binding of AhR, ARNT and AhRR to this XRE. ChIP analyses obtained from HepG2 cells revealed a constitutive association of these three proteins with XRE-3, confirming an involvement of the AhR in regulation of constitutive AhRR gene expression (Fig. 2). Noteworthy, we observed a strong binding of AhR at XRE-3 at time 0. However, in several ChIP experiments using untreated cells, we noticed variations in AhR/XRE binding intensity (data not shown), suggesting a periodic association of AhR with XRE-3 during regulation of constitutive AhRR transcription. A similar constitutive AhR/XRE-binding was reported for the c-myc gene (Yang et al., 2005). Upon treatment of the cells with 3-MC for the indicated times, we observed an oscillating binding-pattern of AhR, ARNT, and AhRR to the respective XRE-3 site of the AhRR intron I (Fig. 2). A similar promoter on-and-off cycling was observed for AhR and nuclear coactivator proteins at the CYP1A1 enhancer (Hestermann and Brown, 2003). This oscillation pattern was accompanied by binding of RNA polymerase II, indicating a high flexibility of the transcription machinery. Although, the time course displays only minor changes in AhRR signal density, the observation that the AhRR binds to its own XRE is exciting, since it suggests a possible autoregulatory loop for AhRR transcription. In contrast to the human AhRR, the murine AhRR gene is regulated by three XRE sites located in the 5′ upstream region of the gene. In addition, three putative GC-boxes have been identified within the enhancer region of the murine AhRR (Baba et al., 2001). Mutational analyses of these GC-box sequences resulted in a lower constitutive and inducible expression of the AhRR (Baba et al., 2001). In this study, we identified a putative GC-box eight bases 5′ upstream of the functional XRE-3 (Fig. 1A). Our data indicate a strong link between the presence of the GC-box and XRE-3, since the deletion of both, the GC-box and XRE-3, resulted in a reduction of basal and inducible luciferase activities (Fig. 1B, pAhRR-Δ4). To clarify whether this GC-box adjacent to XRE-3 is of functional relevance, we blocked this sequence with the selective GC-binding inhibitor MitA and we subsequently investigated AhRR reporter gene activity and mRNA expression. The data from the pAhRR-Δ5 reporter gene assays revealed that MitA-mediated inhibition of GC-box activity interferes with both, the basal and inducible XRE-driven luciferase activity (Fig. 3). This finding points to a cooperative function of the AhR and GC-box recognizing transcription factors in regulation of AhRR expression. RT-PCR analyses perfomed in HeLa cells treated with MitA confirmed the luciferase experiments. In the presence of MitA, the expression of AhRR mRNA decreased in a time-dependent manner (Fig. 4A). This decrease was accompanied by an increase of CYP1A1 mRNA, which was more pronounced after cotreatment with 3-MC and MitA (Fig. 4B). Influence of the HDAC inhibitor NaB on AhRR/XRE binding and CYP1A1 expression in fibroblast and HeLa cells. A, chromatin immunoprecipitation of the CYP1A1 enhancer region with an AhRR antibody in primary fibroblasts. Cells were treated for 16 h with 10 μMB(a)P, 10 mM NaB, or a combination of 10 μMB(a)P and 10 mM NaB. Lane 1, controls; lane 2, B(a)P; lane 3, NaB; and lane 4, B(a)P/NaB. B, effect of NaB on AhRR/XRE binding in HeLa cells. Cells were treated with 10 mM NaB for 16 h, and ChIP analysis was performed as indicated. Lane 1, control; lane 2, NaB. 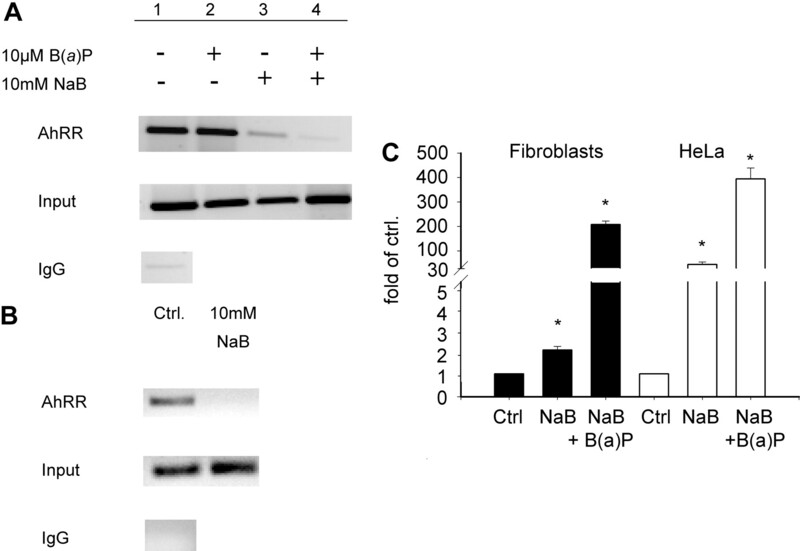 C, influence of NaB on constitutive and inducible CYP1A1 mRNA expression. Cells were treated with 10 mM NaB and 10 μMB(a)P/10 mM NaB for 24 h. CYP1A1 mRNA expression was measured by RT-PCR and normalized to β-actin transcripts. Expression levels are given as -fold of solvent controls. *, significantly different from control. The number of experiments and replicates is as described in the legend of Fig. 1. A cooperative activity between the GC-box binding protein Sp1 and the AhR/ARNT complex was reported for the regulation of human CYP1A1 and CYP1B1 (Kobayashi et al., 1996; Tsuchiya et al., 2003b). It was shown that the bHLH-PAS domains of the AhR/ARNT complex interact with the Sp1 zinc finger motif (Kobayashi et al., 1996). In contrast, a repressive role in the regulation of CYP1A1 was reported for the GC-box binding, Sp1-related transcription factors basic transcription element binding 3, basic transcription element binding 4, and gut-enriched Krüppel-like factor (Imataka et al., 1992; Zhang et al., 1998; Kaczynski et al., 2002). The observed up-regulation of CYP1A1 by MitA may be either due to interference with the GC-box in the AhRR enhancer region and a consequentially decreasing AhRR synthesis or to a displacement of repressive-acting Sp-like molecules from the CYP1A1 enhancer. To test whether Sp1 has a regulatory function in the constitutive expression of the AhRR, we performed transient transfection experiments with siRNA targeted against Sp1 in HeLa cells. No significant effect on the expression of AhRR was found (data not shown), indicating that Sp1 is not the dominant molecule in regulation of the constitutive AhRR gene expression. Therefore, other GC-box binding proteins may account for the observed effects. As described in the literature, HepG2, HeLa and primary fibroblasts differ markedly in their basal expression levels of AhRR and their responsiveness toward AhR agonists (Gradin et al., 1993, 1999; Iwanari et al., 2002; Nakajima et al., 2003; Tsuchiya et al., 2003a). Therefore, we wondered whether the expression level of the AhRR controls the nonresponsiveness of CYP1A1 toward AhR agonists. ChIP analyses performed in high AhRR-expressing primary fibroblasts revealed a strong constitutive binding of the AhRR to XRE motifs of the CYP1A1 gene, which was not affected by B(a)P treatment (Fig. 6A). However, exposure of the cells to the HDAC inhibitor NaB caused a significant decrease in AhRR/XRE binding, which was more pronounced after cotreatment with B(a)P. In agreement with this finding, the constitutive XRE binding of the AhRR observed in HeLa cells was completely diminished after NaB exposure (Fig. 6B). Similar results were observed with TSA (L. Poellinger, personal communication). The results from the ChIP assays suggest that a high amount of constitutive AhRR controls the inducibility of AhR target genes. These data were confirmed by RT-PCR analyses of fibroblast and HeLa cells, treated with NaB alone or in combination with B(a)P. As shown in Fig. 6C, both types of treatment led to an increase of the constitutive and inducible expression of CYP1A1. Similar findings were described for CYP1A1 inducibility in TSA-treated fibroblasts (Gradin et al., 1999) and HeLa cells (Nakajima et al., 2003). The exact mechanism by which NaB interferes with HDAC activities is not known (Davie, 2003). It was reported that NaB disturbs the conformation of a nuclear HDAC/corepressor complex (Downes et al., 2000). The structural integrity of such complexes is important for modulation of the chromatin structure and consequently for gene expression (Grozinger and Schreiber, 2002). In uninduced murine hepatocytes, NaB treatment led to histone hyperacetylation at the CYP1A1 locus. In these cells, the basal CYP1A1 expression is repressed due to an interplay of HDAC and DNA-methyltransferase molecules, representing a strictly epigenetic mechanism of CYP1A1 silencing (Schnekenburger et al., 2007). Therefore, the 3-MC responsiveness of fibroblast and HeLa cells after NaB exposure can be the consequence of an enhanced histone acetylation at the CYP1A1 gene. However, it was reported that the nonresponsiveness of CYP1A1 in fibroblasts depends on a constitutively expressed ARNT-bound factor. The authors speculate that this unknown repressor is able to recruit HDAC molecules to the XREs of CYP1A1 (Gradin et al., 1999). From our data, we hypothesize that the AhRR is part of such a regulatory corepressor complex, which recruits HDAC enzymes and subsequently represses the transcription of genes such as CYP1A1. Although, the precise function of AhRR in CYP1A1 gene regulation is not fully understood, our siRNA results (Fig. 5) let us conclude that the AhRR takes part in the regulation of constitutive and inducible CYP1A1 expression. The AhRR-mediated control of CYP1A1 transcription in primary fibroblasts may be of biological relevance. Fibroblasts are important for wound healing, synthesis of extracellular matrix components and thus essential for the integrity of many organs and tissues (Heckmann and Krieg, 1989). High AhRR levels may be part of a cellular defense mechanism that keeps the expression of CYP1A1 down and thereby protects these cells from toxic metabolites and reactive oxygen species (Haarmann-Stemmann and Abel, 2006). In summary, we cloned a regulatory fragment of the human AhRR gene containing one functional XRE motif and one functional GC-box. The observed association of the AhRR protein with its own XRE site indicates an autoregulatory loop of AhRR expression. In addition, we have shown that the nonresponsiveness of fibroblasts and HeLa cells with regard to CYP1A1 induction by AhR agonists is attributed to binding of the AhRR to the respective XRE sites of the gene. Treatment with the HDAC inhibitor NaB led to dissociation of the AhRR complex from the XRE sites, resulting in recovery of CYP1A1 inducibility. The function of the AhRR in regulation of CYP1A1 transcription is confirmed by RNA interference experiments, showing that a transient AhRR knockdown is accompanied by an increased CYP1A1 mRNA expression. We propose that the AhRR plays an important role in triggering the expression and induction of AhR-regulated genes such as CYP1A1. The precise molecular mechanisms of how the AhRR regulates XRE-driven gene expression remain to be further elucidated. We thank Dr. Gabriele Vielhaber (Symrise GmbH and Co. KG, Holzminden, Germany) for the kind donation of 3′-methoxy-4′-nitroflavone, and Birgit Neumann for technical support. ABBREVIATIONS: AhR, aryl hydrocarbon receptor; bHLH, basic helix-loop-helix; PAS, period/aryl hydrocarbon receptor nuclear translocator/single-minded (PER-ARNT-SIM); B(a)P, benzo(a)pyrene; 3-MC, 3-methylcholanthrene; ARNT, aryl hydrocarbon receptor nuclear translocator; XRE, xenobiotic-responsive element; AhRR, aryl hydrocarbon receptor repressor; MitA, mithramycin A; NaB, sodium butyrate; DMSO, dimethyl sulfoxide; MNF, 3′-methoxy-4′-nitroflavone; Sp, specificity protein; PCR, polymerase chain reaction; siRNA, small-interfering RNA; RT, reverse transcription; ChIP, chromatin immunoprecipitation; PBS, phosphate-buffered saline; kb, kilobase(s); bp, base pair(s); HDAC, histone deacetylase; TSA, trichostatin A.
Baba T, Mimura J, Gradin K, Kuroiwa A, Watanabe T, Matsuda Y, Inazawa J, et al. (2001) Structure and expression of the Ah receptor repressor gene. J Biol Chem 276: 33101–33110. Bernshausen T, Jux B, Esser C, Abel J, and Fritsche E (2006) Tissue distribution and function of the aryl hydrocarbon receptor repressor (AhRR) in C57BL/6 and aryl hydrocarbon receptor deficient mice. Arch Toxicol 80: 206–211. Blume S, Snyder R, Ray R, Thomas S, Koller C, and Miller D (1991) Mithramycin inhibits SP1 binding and selectively inhibits transcriptional activity of the dihydrofolate reductase gene in vitro and in vivo. J Clin Invest 88: 1613–1620. Bock KW and Köhle C (2006) Ah receptor: dioxin-mediated toxic responses as hints to deregulated physiologic functions. Biochem Pharmacol 72: 393–404. Cauchi S, Stucker I, Cenee S, Kremers P, Beaune P, and Massaad-Massade L (2003) Structure and polymorphisms of human aryl hydrocarbon receptor repressor (AhRR) gene in a french population: relationship with CYP1A1 inducibility and lung cancer. Pharmacogenetics 13: 339–347. Crews S and Fan C (1999) Remembrance of things PAS: regulation of development by bHLH-PAS proteins. Curr Opin Genet Dev 9: 580–587. Davie JR (2003) Inhibition of histone deacetylase activity by butyrate. J Nutr 133: 2485S–2493S. Denison MS and Nagy SR (2003) Activation of the aryl hydrocarbon receptor by structurally diverse exogenous and endogenous chemicals. Annu Rev Pharmacol Toxicol 43: 309–334. Downes M, Ordentlich P, Kao HY, Alvarez JGA, and Evans RM (2000) Identification of a nuclear domain with deacetylase activity. Proc Natl Acad Sci USA 97: 10330–10335. Evans BR, Karchner SI, Franks DG, and Hahn ME (2005) Duplicate aryl hydrocarbon receptor repressor genes (Ahrr1 and Ahrr2) in the zebrafish Danio rerio: structure, function, evolution, and AHR-dependent regulation in vivo. Arch Biochem Biophys 441: 151–167. Fritsche E, Cline JE, Nguyen NH, Scanlan TS, and Abel J (2005) Polychlorinated biphenyls disturb differentiation of normal human neural progenitor cells: clue for involvement of thyroid hormone receptors. Environ Health Perspect 113: 871–876. Gradin K, Toftgard R, Poellinger L, and Berghard A (1999) Repression of dioxin signal transduction in fibroblasts–identification of a putative repressor associated with Arnt. J Biol Chem 274: 13511–13518. Gradin K, Wilhelmsson A, Poellinger L, and Berghard A (1993) Nonresponsiveness of normal human fibroblasts to dioxin correlates with the presence of a constitutive xenobiotic response element-binding factor. J Biol Chem 268: 4061–4068. Grozinger CM and Schreiber SL (2002) Deacetylase enzymes: biological functions and the use of small-molecule inhibitors. Chem Biol 9: 3–16. Gu YZ, Hogenesch JB, and Bradfield CA (2000) The PAS superfamily: sensors of environmental and developmental signals. Annu Rev Pharmacol Toxicol 40: 519–561. Haarmann-Stemmann T and Abel J (2006) The arylhydrocarbon receptor repressor (AhRR): structure, expression, and function. Biol Chem 387: 1195–1199. Heckmann M and Krieg T (1989) Biological and pharmacological modulations of fibroblast functions. Skin Pharmacol 2: 125–137. Hestermann EV and Brown M (2003) Agonist and chemopreventative ligands induce differential transcriptional cofactor recruitment by aryl hydrocarbon receptor. Mol Cell Biol 23: 7920–7925. Imataka H, Sogawa K, Yasumoto K, Kikuchi Y, Sasano K, Kobayashi A, Hayami M, and Fujii-Kuriyama Y (1992) Two regulatory proteins that bind to the basic transcription element (BTE), a GC box sequence in the promoter region of the Rat P-4501A1 gene. EMBO J 11: 3663–3671. Iwanari M, Nakajima M, Kizu R, Hayakawa K, and Yokoi T (2002) Induction of CYP1A1, CYP1A2, and CYP1B1 mRNAs by nitropolycyclic aromatic hydrocarbons in various human tissue-derived cells: chemical-, cytochrome P450 isoform-, and cell-specific differences. Arch Toxicol 76: 287–298. Kaczynski J, Conley AA, Fernandez Zapico M, Delgado SM, Zhang JS, and Urrutia R (2002) Functional analysis of basic transcription element (BTE)-binding protein (BTEB) 3 and BTEB4, a novel Sp1-like protein, reveals a subfamily of transcriptional repressors for the BTE site of the cytochrome P4501A1 gene promoter. Biochem J 366: 873–882. Kobayashi A, Sogawa K, and Fujii-Kuriyama Y (1996) Cooperative interaction between AhR/Arnt and Sp1 for the drug-inducible expression of CYP1A1 gene. J Biol Chem 271: 12310–12316. Korkalainen M, Tuomisto J, and Pohjanvirta R (2004) Primary structure and inducibility by 2,3,7,8-tetrachlorodibenzo-p-dioxin (TCDD) of aryl hydrocarbon receptor repressor in a TCDD-sensitive and a TCDD-resistant rat strain. Biochem Biophys Res Commun 315: 123–131. Lu Y, Santostefano M, Cunnigham B, Threadgill M, and Safe S (1995) Identification of 3′-methoxy-4′-nitroflavone as a pure aryl hydrocarbon (Ah) receptor antagonist and evidence for more than one form of the nuclear Ah receptor in MCF-7 human breast cancer cells. Arch Biochem Biophys 316: 470–477. Ma Q (2001) Induction of CYP1A1. The AhR/DRE paradigm: transcription, receptor regulation, and expanding biological roles. Curr Drug Metab 2: 149–164. Marlowe JL and Puga A (2005) Aryl hydrocarbon receptor, cell cycle regulation, toxicity, and tumorigenesis. J Cell Biochem 96: 1174–1184. Mimura J and Fujii-Kuriyama Y (2003) Functional role of AhR in the expression of toxic effects by TCDD. Biochim Biophys Acta 1619: 263–268. Mimura J, Ema M, Sogawa K, and Fujii-Kuriyama Y (1999) Identification of a novel mechanism of regulation of Ah (Dioxin) receptor function. Genes Dev 13: 20–25. Nakajima M, Iwanari M, and Yokoi T (2003) Effects of histone deacetylation and DNA methylation on the constitutive and TCDD-inducible expressions of the human CYP1 family in MCF-7 and HeLa cells. Toxicol Lett 144: 247–256. Nebert D, Roe A, Dieter M, Solis W, Yang Y, and Dalton T (2000) Role of the aromatic hydrocarbon receptor and [Ah] gene battery in the oxidative stress response, cell cycle control, and apoptosis. Biochem Pharmacol 59: 65–85. Nehls MC, Brenner DA, Gruss HJ, Dierbach H, Mertelsmann R, and Herrmann F (1993) Mithramycin selectively inhibits collagen-alpha 1(I) gene expression in human fibroblast. J Clin Invest 92: 2916–2921. Nishihashi H, Kanno Y, Tomuro K, Nakahama T, and Inouye Y (2006) Primary structure and organ-specific expression of the rat aryl hydrocarbon receptor repressor gene. Biol Pharm Bull 29: 640–647. Roy NK, Courtenay SC, Chambers RC, and Wirgin II (2006) Characterization of the aryl hydrocarbon receptor repressor and a comparison of its expression in Atlantic tomcod from resistant and sensitive populations. Environ Toxicol Chem 25: 560–571. Schnekenburger M, Talaska G, and Puga A (2007) Chromium cross-links HDAC1.DNMT1 complexes to chromatin inhibiting histone remodeling marks critical for transcriptional activation. Mol Cell Biol 27: 7089–7101. Tsuchiya Y, Nakajima M, Itoh S, Iwanari M, and Yokoi T (2003a) Expression of aryl hydrocarbon receptor repressor in normal human tissues and inducibility by polycyclic aromatic hydrocarbons in human tumor-derived cell lines. Toxicol Sci 72: 253–259. Tsuchiya Y, Nakajima M, and Yokoi T (2003b) Critical enhancer region to which AhR/ARNT and Sp1 bind in the human CYP1B1 gene. J Biochem 133: 583–592. Whitlock JP Jr (1999) Induction of cytochrome P4501A1. Annu Rev Pharmacol Toxicol 39: 103–125. Yamamoto J, Ihara K, Nakayama H, Hikino S, Satoh K, Kubo N, Iida T, Fujii Y, and Hara T (2004) Characteristic expression of aryl hydrocarbon receptor repressor gene in human tissues: organ-specific distribution and variable induction patterns in mononuclear cells. Life Sci 74: 1039–1049. Yang X, Liu D, Murray TJ, Mitchell GC, Hesterman EV, Karchner SI, Merson RR, Hahn ME, and Sherr DH (2005) The aryl hydrocarbon receptor constitutively represses c-myc transcription in human mammary tumor cells. Oncogene 24: 7869–7881. Zhang W, Shields JM, Sogawa K, Fujii-Kuriyama Y, and Yang VW (1998) The gut-enriched Kruppel-like factor suppresses the activity of the CYP1A1 promoter in an Sp1-dependent fashion. J Biol Chem 273: 17917–17925.